On October 10, Ankara, the Turkish capital, was hit by explosions in what appears to be the deadliest single act of terrorism to occur on Turkish soil in the country’s modern history. 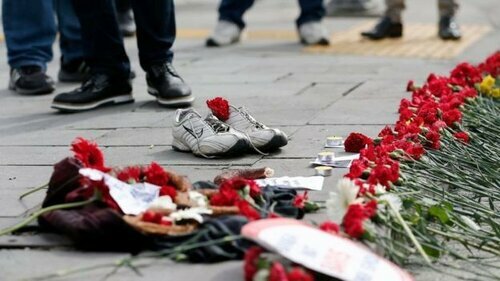 According to official data, at least 95 people were killed in twin blasts as left-wing unions gathered to put forward social demands and protest the war against Kurds. The Peoples' Democratic Party, which defends the interests of Turkish Kurds among other things, says the death toll was as high as 128. There were hundreds of wounded. Some details of what happened are still not clear (how could the terrorists get unhindered to the place of mass protest encircled by security forces?). Evidently, the terrorist act was thoroughly prepared to kill as many people as possible. The bombs were packs of TNT equipped with fragmentation elements for increased destructive effect. The second blast occurred right at the place where people were running in panic after the first bomb went off. The political situation in Turkey is tense enough as the country has been facing all kinds of elections taking place one after another for more than a year and a half. Now passions have become inflamed even more. The Justice and Development Party of Turkish Recep Tayyip Erdoğan did not receive the expected support at the June parliamentary election and failed to form a viable coalition government. Analysts believe that the reason was the success of the Peoples' Democratic Party, which received 13 percent of votes. The snap election to parliament (the Grand National Assembly of Turkey) is slated for November 1. As recent polls show, the rating of Justice and Development Party is even lower than in June. The option of postponing the election is on the table. It’s a sad fact that some commentators believe that the Russia’s operation against the Islamic State in the neighboring Syria is the root of all evil. They say it made Turkey less safe as a result of growing cross-border threats. The accusations against “Kurdish separatists” hold no water, especially in view that activists of the Peoples' Democratic Party were among those who lost their lives as a result of the terror act. Most likely the Islamic State militants are behind the blasts. This is the most plausible version. Reuters got this information from its special services’ sources. One of them said the type of explosive and the choice of target pointed to a group within Islamic State that perpetrated a terror act in the southeastern Turkish town of Suruc near the Syrian border. A similar blast took place some time ago in Diyarbakır, the informal capital of Kurds in Turkey. Kurdish activists were also among the victims. According to an anonymous source in the ranks of Turkey’s security forces, the Islamic State is identified as the primary focus of investigation. It was to be expected. The terrorist activities have been intensified in Turkey recently. Radical sentiments are on the rise in the country. A video has appeared recently to circulate in social networks where unknown people threaten the Turkey’s President and express the intent to “conquer Istanbul.” To large extent, it is explained by the influence of the conflict in Syria which has entered its fifth year. From its very beginning Turkey supported armed groups affiliated with the Islamic State. Russian President Vladimir Putin has expressed his condolences to the Turkish leadership over the deadly terrorist attack in the southeast of Turkey. "It is necessary to unite efforts in the fight against this evil,” he added. Only the actions taken together could bring results, the President noted. It’s important that this message finally gets across to intended recipients. As for now, Turkey reacts the same way it did after the Suruc blast. The Turkish air force launched strikes against the positions of Kurdistan Workers' Party, no matter the latter had introduced a moratorium on combat actions till November 1. There is no intention on the part of Turkish government to review the policy aimed at support of armed opposition in Syria and overthrow of Bashar al-Assad. Many Turks don’t currently share the government’s view on the problem of Syria. The situation in the region and the world started to rapidly change after Russia launched its military operation in that country on September 30. Running away under the attacks launched by Syrian forces supported by Russia and Iran, groups of militants can really start to move towards Turkish or Jordanian borders. So far, the Russia’s government has not put Turkey on the list of dangerous countries to travel to, but the country is becoming less safe. It gives rise to serious concern.